In a region filled with great modern cities, Seoul can still stand out as one of the more interesting and wealthy, with the historical and cultural heft to match. 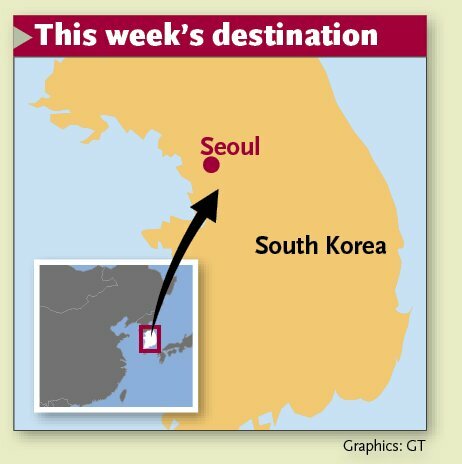 The South Korean capital has had a global profile since back in 1988, when it hosted the Summer Olympic Games. Since then, it has become a major tourist destination for travelers from across Asia, especially Chinese. It is also one of the biggest cities in the world, forming the center of a metropolitan region of over 25 million, or half of the nation. To travel in Seoul, first off, make full use of the subway. Sometimes claimed to be the world's longest, it's convenient, extensive and covers almost all of the city, even going to the capital's satellite cities like Incheon, where the city's international airport is located, and Suwon. At first glance the subway map looks intimidating, and it's certainly a bit more difficult than Beijing, Hong Kong, and Shanghai, but just keep track of which line and station you need to get to and you'll find your way. My Korean friend had warned me the subway can be very crowded. Living in Beijing and having gotten accustomed to the rough and tumble of its subway, I can attest that Seoul's subway is quite manageable in this regard. That the city is ultra-modern is without doubt, but it also has a history of over 2,000 years. It has been the capital of Korea since the Joseon Dynasty (1392-1910). This proud history can be viewed at the royal palaces and the museums, awhile traces of it can be physically viewed in the large city gates at Nandaemun (South Gate) and Dongdaemun (East Gate). These two landmarks are the largest remaining major gates of a fortress wall that surrounded Seoul in the past. Seoul has five royal palaces, all grand and immaculately maintained. These palaces all suffered damage from Japanese occupation forces during the early 20th century. The biggest one is Gyeongbokgung, which was constructed in 1395 and housed the royal court before being destroyed by Japanese invaders. It was reconstructed in 1867 before being heavily damaged again by Japanese forces. Since then, it has been extensively renovated, and many of the buildings are modern reconstructions. 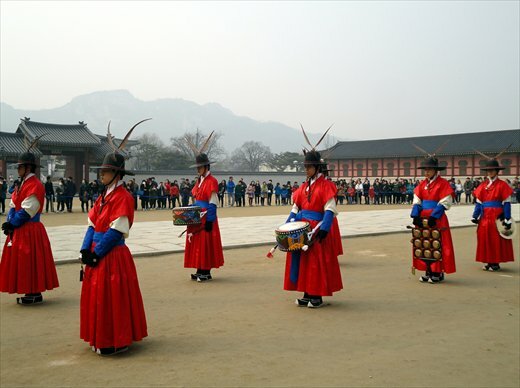 At Gyeongbokgung's large outer gate, an elaborate changing of the guard is done at set times every day. It's a fine sight, with guards in garish costumes doing elaborate maneuvers accompanied by musicians playing loud wailing and clanging on ancient instruments. It really feels like going back centuries. The palace features several main halls, with smaller elegant wooden ones to the side. To the back are open areas which lead to former residences of royals, pavilions, and even a library. One of the most attractive sights is Gyeonghoeru, an elevated pavilion located on a pool that used to be used for royal banquets. On the northeast side is the Folk Museum, which features displays and artifacts of Korean life, ranging from ancient tools to traditional rituals to funeral biers. On the outside is a recreation of an early 20th century Korean town, replete with houses, diners, and artisan workshops as well as a tram. Running perpendicular to Gyeonbokgung is Sejongro boulevard, which is literally the heart of the city. Walking straight down, you can see the statues of King Sejong the Great, who invented the Korean alphabet and oversaw major scientific and technological achievements, and Admiral Yi Sun-shin, one of Korea's greatest heroes for having defeated the Japanese with his "turtle ships" in the 16th century. Clearly keen to see an anti-Japanese hero, Chinese tourists were crowded around the statue when I visited. Keep on walking because at the end of the boulevard is the starting point of the artificial Cheonggyecheon stream. This famous landmark runs for 5.8 kilometers, an unnatural but serene channel that provides a fine counterbalance to the bustling traffic and activity all around it. The National Museum of Korea is a gigantic building, fronted by a pond and garden. It's well worth a visit, showcasing Korea's long history from prehistoric times to the early 20th century. There are fine collections of art, calligraphy and sculptures, including one of exhibits from all over Asia. The main hall features a 13-meter-tall 650-year-old stone pagoda at the end. 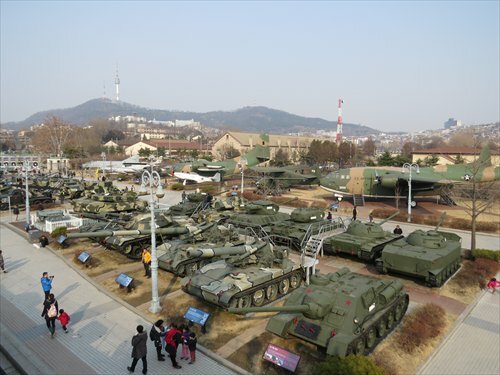 A few subway stops away from the national museum is the Korean War Memorial, which is also Korea's main military history museum. In the front are a few giant sculptures, one of which is an enormous upright bomb-shaped sculpture with two groups of soldiers at the sides. Before you enter the memorial, go to the side. You'll see one of the most impressive displays of genuine planes, tanks, cannons and helicopters anywhere, including famous planes like the massive B-52 bomber that has been used from the Vietnam War to the Gulf War, and the Korean War-era F-86 and the Soviet MIG-15. There's also a full-scale reconstruction of a frigate in which 6 crewmen died in a sea battle with North Korea in 2002. If I hadn't read the sign, I would have thought this was the actual ship itself. Inside the memorial, the displays might be more ancient but also impressive. There are ancient Korean weapons including wicked looking arrow guns and a multi-barreled "cannon" as well as large-scale paintings of historical battles against invading Japanese, Mongolian, and even Chinese armies. There's even a large wooden reconstruction of a turtle boat, the iron-bottomed ships which were Admiral Yi Sun-shin's main weapon in defeating the Japanese invaders. On the top, there is a somber memorial hall for the Korean War (1950-53), including displays devoted to all the nations which contributed units. Art lovers can check out the National Museum of Modern and Contemporary Art. Costing a cool $230 million, the museum's Seoul branch opened last November, right next to Gyeongbokgung. There are a couple of smaller branches in other parts of the country. The main attraction inside is a full-size 3-story frame of a house, made out of translucent blue cloth, within which hangs a smaller traditional home. The best of modern Korean art is showcased with various paintings, sculptures and multimedia and abstract exhibits. I'm not much of a shopper but Seoul is a paradise for those who are. For midrange clothes and food, Myeongdong is probably the most well-known area, full of chain stores, boutiques, and street food vendors. Even on a Monday afternoon, there were people everywhere. Dongdaemun is a major fashion district, with several large department stores as well as a night market consisting of dozens of vendors under yellow tents selling cheaper stuff. There's even a building that is similar to Yashow Market in Beijing's Sanlitun, where dozens of clothes vendors sell from small booths on each floor. There are other neighborhoods, including the now infamous upscale Gangnam. Dongdaemun is also where you'll find the new Dongdaemun Design Plaza which just opened in March. This massive $451 million entity was designed by Zaha Hadid, a famous British architect who also designed the Guangzhou Opera House. Meant to put Dongdaemun district on the regional map as a fashion and cultural center, the plza's long smooth shape resembles a space ship and looks fantastic at night, though not so great during the day. 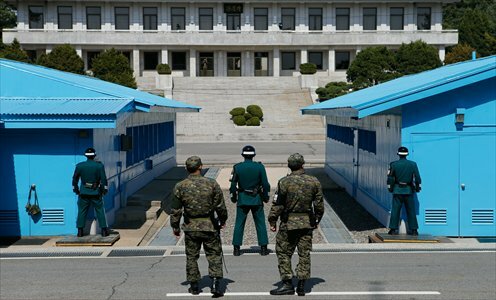 Despite the nation's modernity and pop culture the Korean Peninsula is one of the most militarized places on the world, due to the tensions between South Korea and its northern neighbor. A trip to the border, called the DMZ (Demilitarized Zone), on a tour from Seoul is a way to see this up close. Tours go to the edge of the DMZ with stops including an observatory on a hill that looks out over the DMZ and North Korea, the Dorasan train station, a new but unused station that would serve any future inter-Korea railway, and an underground tunnel that was dug by the North in an attempt to invade. The Joint Security Area, which is a meeting site and where troops from both sides are present, is also a popular attraction. The place is widely known in part because of the eponymous award winning movie. Beyond the tourist sites, Seoul is a good city to just walk around, being full of interesting architecture, bustling areas and of course, that stream. While it might not be as well-known, Seoul takes its place comfortably as a great East Asian metropolis, an equal and rival to the likes of Tokyo, Hong Kong and Shanghai. When to go: Seoul experiences all four seasons. Spring (Mar-May) and autumn (Sep-Oct) are the most pleasant. Winters are cold, though places are less crowded, and summer can be humid with heavy rain.